A quick, easy, light, healthy and tasty chowder starring cauliflower as the main ingredient that is a bowl of comfort food at it’s best! 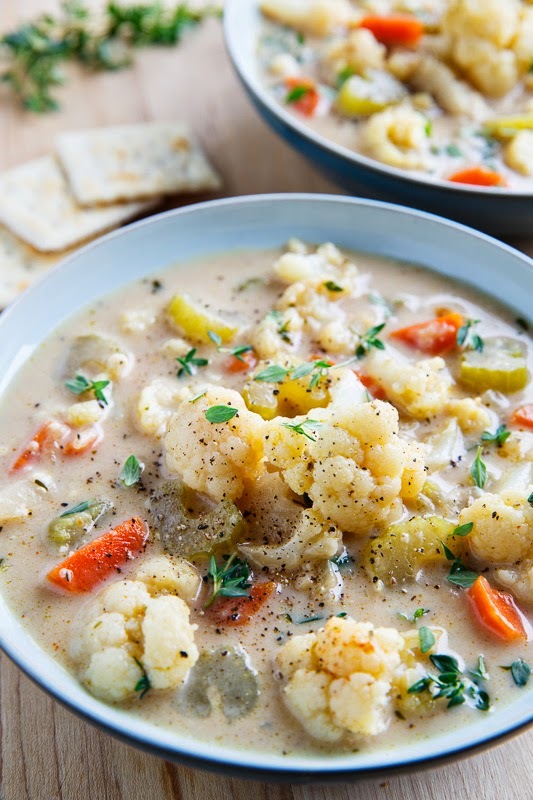 It’s time for another soup and this time it’s a cauliflower chowder that is so quick, easy, light, healthy and so tasty that you’ll be coming back for seconds every time! 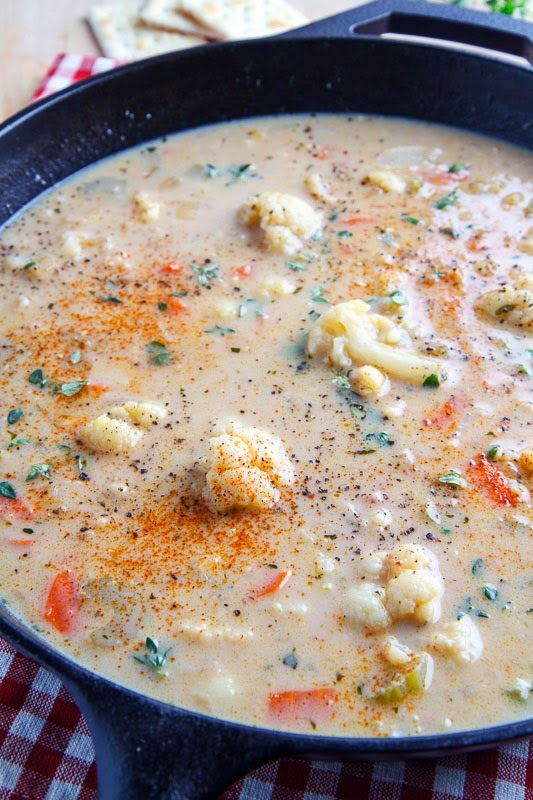 My favourite cauliflower soup is my roasted cauliflower and aged white cheddar soup where the cauliflower is pureed to make a smooth soup but it’s also nice to get the texture of the cauliflower and this chowder does just that. This recipe could not be simpler, you just saute the standard three veggies, onions, carrots and celery in oil, add some flour as a thickener, add the broth and cauliflower, simmer until the cauliflower is tender, add the cream and season to taste. 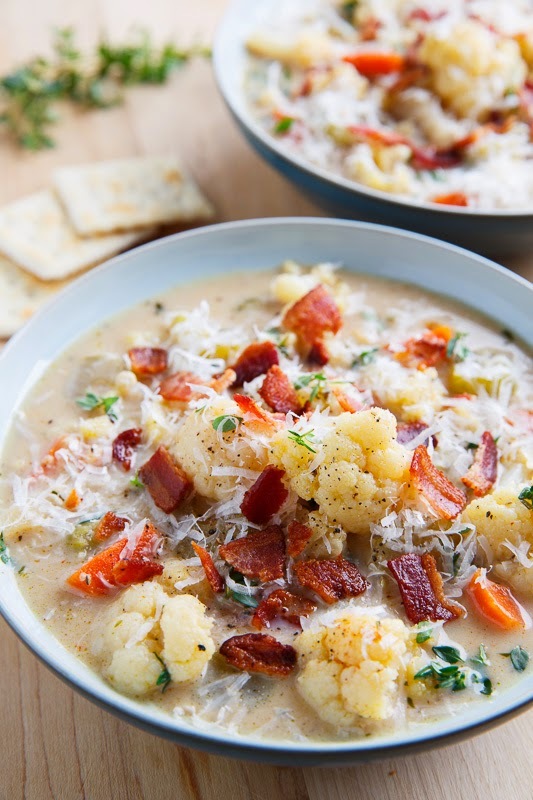 The recipe as written is really good but I like to kick things up a bit by adding some umami in the form of melting parmesan cheese into the chowder, adding miso paste and finally by giving into my inner bacon addiction and topping things off with some crispy bacon! This is definitely one of my new favourite soups with it being both hearty and tasty while also being light and healthy and it’s also a bowl of pure comfort food that is perfect for these cold winter days! Perfect all by itself but even better with a touch of parmesan! Slowly stir in the broth, deglazing the pan as you go, add the cauliflower and bay leaves, bring to a boil, reduce the heat and simmer until the cauliflower is tender, about 10-15 minutes. Add the cream, season with salt, pepper and cayenne to taste, remove the bay leaves, remove from the heat and enjoy. Option: Top with crumbled bacon! Note: The cook time will vary depending on how large or small you cut the cauliflower. Totally NEED this soup after skiing the slopes today!! 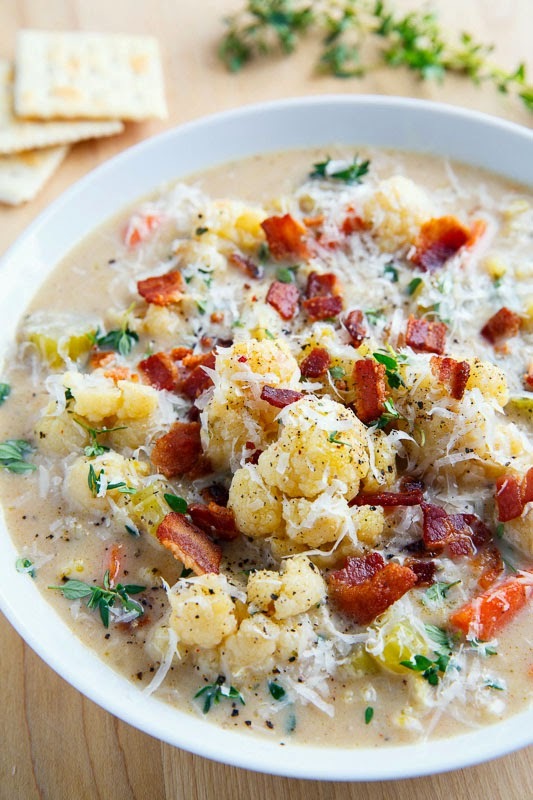 Kevin, I LOVE cauliflower in soup. . like love it. . can't wait to try this and your roasted cauliflower and aged white cheddar soup!!! soup for days!! love this! YES this chowder is everything!!!! I'm in love. Pinned right away. Great recipe for a rainy day like today! What a delicious looking chowder!!! Love this! There are never enough ways to eat cauliflower, and I'm definitely trying this one next! Thanks! Perfect timing Kevin ! We have a forecast of another big winter storm coming this weekend.. 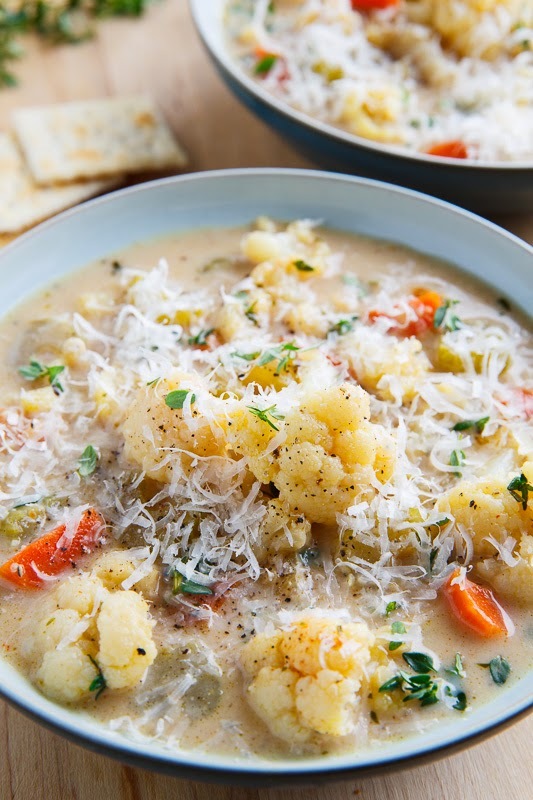 I will go to the store tomorrow and stock up and make this soup.I love cauliflower .. it sounds so tasty ! This may be the most gorgeous soup I've ever seen!! Made this today and it was delicious! I used milk and threw in a Parmesan rind…love your miso suggestion and will be trying that next time. This soup is comforting, rich tasting and filled with veggies. It was the perfect recipe for a cold, gray day like today. Thank you! I love this chowder! It doesn't get any better than healthy comfort food! Kimberly Porter: I'm glad that you enjoyed it! I love adding miso to soups like this! How does it taste with the miso? And what type of miso did you use? I know there are several kinds/ flavors. I've only ever had miso soup. Thanks. eeoj: I use white miso for this soup and since I add so little, normally it is about one tablespoon per 2 cup serving of miso soup and this is 1-2 tablespoons for 8 cups of soup, it is more like a subtle undertone where most people could not tell that it was there but it adds that something special, kind of like adding a touch of nutmeg to a béchamel sauce or other savoury dish. This sounds just perfect: earthy yet hearty. You did it again, such a great recipe, especially with the cold we are having right now Kevin! Bacon makes everything better. So does melted cheese!! Thanks for the recipe! cooked this yesterday for my wife and i. it was so good that only a very small bowl remained. thanks Kevin, the recipe is so good! Jack Yeager: I'm glad you enjoyed it!